MainAll NewsInside IsraelKnesset Approves "Grunis Law"
Knesset approves second and third readings of the Grunis Law by a vote of 57 to 37. 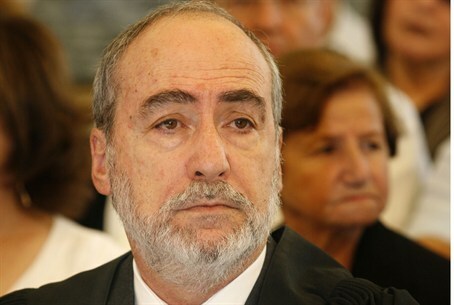 The Knesset approved on Monday evening the second and third readings of the law which has been dubbed the “Grunis Law”. 57 Knesset Members voted for the law and 37 voted against it. The bill amends the Courts Law by canceling the item that says a Supreme Court President may only be appointed if he has at least three years remaining before his retirement. On the day in which the current Supreme Court President Dorit Beinisch is to retire – February 28, 2012 – Grunis will have 41 days less than three years left until his retirement at age 70. He would have been ineligible to serve as President under the previous law. The bill was submitted by MK Ya’akov “Ketzaleh” Katz of the National Union. Justice Grunis is against the activist Supreme Court policy initiated by former Chief Justice Aharon Barak, who claimed that “everything is judiciable” in the courts and proceeded to act upon that principle. Under Barak, Beinisch's mentor, the court used this principle to change the route of the security fence to comply with Arab claims and to open route 443 to Arab drivers, despite IDF security-related objections. The Grunis Law passed its first reading in November by a 52-35 margin. Many leftists have publicly spoken out against the legislation, despite Grunis’ left-leaning views, just because he does not support the “everything is judiciable” approach. Some have said the legislation is “unconstitutional”, even though Israel has no constitution.